Would it help the Dodd-Frank repeal situation, Mr. Johnson, if all us “little people” stopped doing business with the big banks and went to a credit union? I thought that this was already done when the budget was passed. When an exclusion was done on derivatives. Or their approach to the general media and public…? “The sudden dramatic collapse in the price of oil appears to be an act of geopolitical warfare against Russia. The result could be trillions of dollars in oil derivative losses; and depositors and taxpayers could be liable, following repeal of key portions of the Dodd-Frank Act signed into law on December 16th. A fraction, but a critical fraction, as it included the banks’ bets on commodities. Five percent of $280 trillion is $14 trillion in derivatives exposure – close to the size of the existing federal debt. $3.9 trillion of this speculation is on the price of commodities. Among the banks’ most important commodities bets are oil derivatives. …And now the House of Representatives is about to show us the worst of government for the rich and powerful. The House is about to vote on a budget deal — a deal negotiated behind closed doors that slips in a provision that would let derivatives traders on Wall Street gamble with taxpayer money and get bailed out by the government when their risky bets threaten to blow up our financial system. Actually, the rule is pretty simple. Here’s what it’s called — the rule that the House is about to repeal — and I’m quoting from the text of Dodd-Frank: “PROHIBITION AGAINST FEDERAL GOVERNMENT BAILOUTS OF SWAPS ENTITIES.” What does it do? The provision that’s about to be repealed requires banks to keep separate a key part of their risky Wall Street speculation so that there’s no government insurance for that part of their business…. We put this rule in place after the collapse of the financial system because we wanted to reduce the risk that reckless gambling on Wall Street could ever again threaten jobs and livelihoods on Main Street. We put this rule in place because people of all political persuasions were disgusted at the prospects of future bailouts. And now, no debate, no discussion, Republicans in the House of Representatives are threatening to shut down the government if they don’t get a chance to repeal it. …Wall Street spends a lot of time and money on Congress. Public Citizen and the Center for Responsive Politics found that in the run-up to Dodd-Frank, the financial services sector employed 1,447 former federal employees to carry out their lobbying efforts — including 73 former Members of Congress. 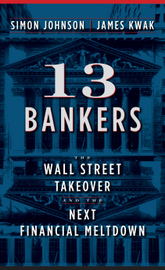 And according to a report by the Institute for America’s Future, by 2010, the six biggest banks and their trade associations employed 243 lobbyists who once worked in the federal government, including 33 who had worked as chiefs of staff for members of Congress and 54 who had worked as staffers for the banking oversight committees in the Senate and the House. That’s a lot of former government employees — and senators and Congressmen — pounding on Congress to make sure the big banks get heard. No surprise that the financial industry spent more than $1 million a day lobbying Congress on financial reform…. It’s been opposed by current and former leaders of the FDIC, including Sheila Bair — a Republican who formerly chaired the agency, and Thomas Hoenig, the current vice-chairman of the agency. For those who are keeping score, this is the agency that will be responsible for bailing out Wall Street when their risky bets go sour…. But this provision goes too far. Citigroup is large, and it is powerful. But it is a single, private company. It shouldn’t get to hold the entire government hostage — to threaten a government shutdown — in order to roll back important protections that keep our economy safe. This is a democracy, and the American people didn’t elect us to stand up for Citigroup. They elected us to stand up for all of the people. “The “push out” provision reversed a piece of the 2010 Dodd-Frank law that prohibited banks from trading some of their most exotic financial instruments in units covered by the Federal Deposit Insurance Corporation or the Federal Reserve. The idea was to make sure trades in derivatives, credit-default swaps and other instruments that helped spur the financial crisis of 2008 would not be insured by taxpayers if they went bad. We have enough “evidence” – Detroit, for example – that the right of every human being to make their life less miserable through honest work has been taken away by the gene pool of “enronistas” in USA, so I agree with Prof. Pezzuto – what is the surprise? The surprise is that there is no HUMAN “process” for containing them. The “mathematical certainty” of a rigged casino…fiat $$$$ distributed as debt…. Two groups, Moveon.org and Democracy for America, announced Friday that more than 200,000 people have signed their “Run Warren Run” petition encouraging her to seek the Democratic nomination. You’re probably looking at the welcome mat situated in front of the White House for 2016: President Jeb Bush (with his First Lady,Columba Garnica Gallo) with his Vice-President that actually served in the military. President Bush had also checked the Diversity box; checked the box with social conservatives (Christian, pro-life) and checked the lunch-bucket working class by reinventing Reaganomic. I’m glad somebody’s working, but the law of numbers is not on our side here Bruce, we are out maned, but definitely not out gunned. When politics needs money, call on Mitt Romney. Can we call them “French Fries” again instead of “Freedom Fries”? If it is a Bush vs. Clinton match up, people will finally be free to set up a new seat of government besides D.C.
We actually DO have the right to do that. It has always been a KNOWN known that power corrupts absolutely and when the character of the people who scratched and clawed and MURDERED their way to DC power is no longer an UNKNOWN, it is time. Every human being has the right to make their life less miserable through honest work. Why would USA send a person to join a Free Speech march in France?! The current Supreme Court would find a way to find a loophole in something or other and declare it illegal…. Militarized police were sent in to snuff out “Occupy Wall Street”. As if conducting economic genocide against 52 million Middle Class USA born and bred citizens was not an act of violence and “terror” because it was not done with a Kalishnikov…. one need not look any further than this – possibly the MOST ignorant and bat sht crazy dude in the Senate getting this pay-ur-pal position for marshaling the resources necessary for infrastructure improvement across USA territory (using the knowledge NASA et al have)…. Warren said Monday that it is imperative for Treasury to focus its energy on strengthening the enforcement of consumer protections on Wall Street. Hey Annie, are they young gene pools or old ones? smelly old fart gene pool producing the next gen – the Adam Lanzas and al queerda and hoody fashion conscious IS – next cartoon – the vanity involved in getting dressed for the public relations photos – what’s next? Calvin Klein (or any other “designer” label terrorist line of super soft fleece black face masks…? the flaws are not 50% more pronounced in the next gen – their strength is an exponential rise….